Take the opportunity to contribute to the preservation of the environment by harnessing solar power. 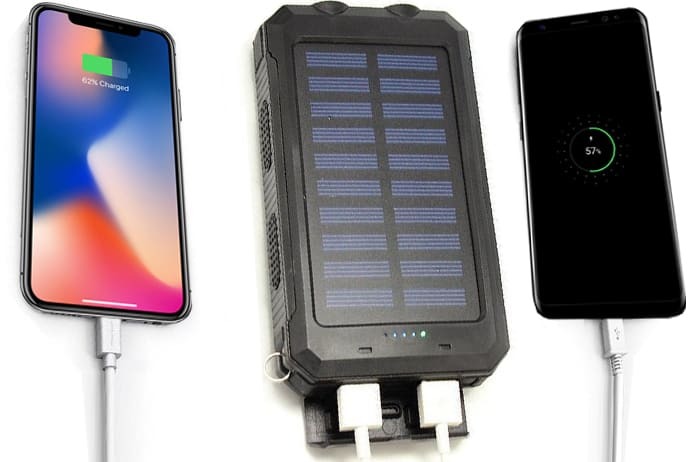 A great way to do this can be by choosing one of the solar power banks listed below, which are compatible with the iPhone XS MAX, XS, XR, X, 8, 8+, 7, 7+, 6, 6S+ and the iPad. It is a well known fact that Apple provides continuous upgrades to the iPhone and the iPad every passing year and we see new software and hardware and other shiny features quite regularly. However, the battery is one thing that doesn’t see a noticeable upgrade. It doesn’t matter how efficient the software or hardware becomes it will still keep consuming additional battery with every upgrade. So, what we have is a situation where the Apple devices are becoming more and more heavily power consuming, in addition to apps and games that are constantly installed. The simple method to overcome this issue is to make use of power banks. 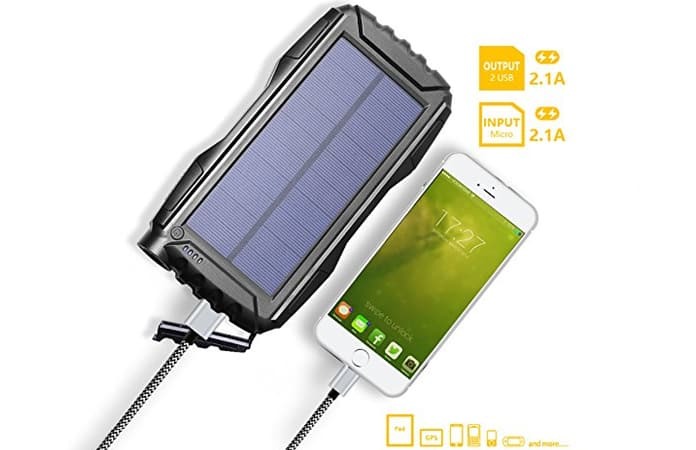 Another problem with power banks is that they often need to be charged once they are depleted but this problem can be circumvented by using solar power banks that do not require any external power source besides normal light. This device features a 20,000 mAh battery, along with all the necessary safety features. The LED indicators provide signals for how much of the battery is used and how much remains while dual port USB allows simultaneous fast charging. This is a tank amongst power banks and is shockproof, dustproof and even to an extent waterproof. The silicone rubber, ABS and PC material make it very tough and each of the two USB ports provides a 2.4A output for quick charging. The Smart IC technology avoids short circuit damage and the LED lights have four modes such as maximum brightness, low brightness, strobe and SOS. This power bank is available in black, blue, orange and red. 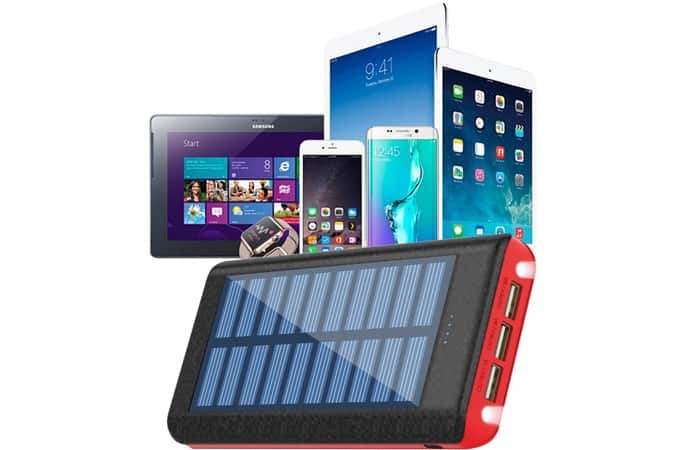 This is one of the top rated solar power banks that has proven to be exceptional on many fronts. 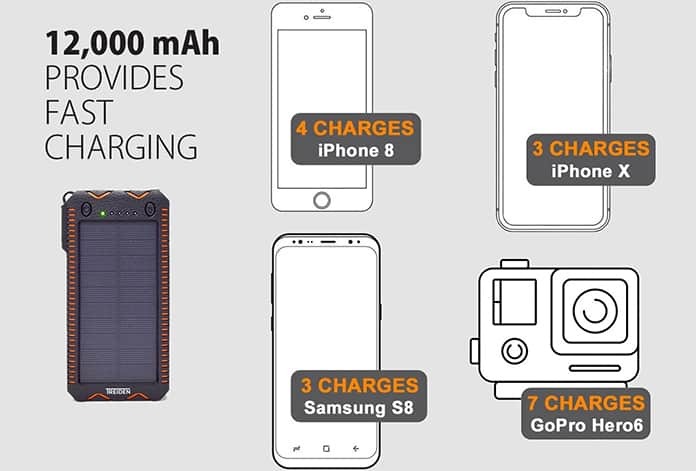 There is a truly large 25,000 mAh battery which can charge the smartphone up to 7 to 8 times. The two USB ports can deliver a 2.1A output so that more than one device can be powered simultaneously. The numerous protections systems avoid hazards like short circuiting and overcharging and the CE, RoHS and FCC certifications provide reliability. The four LED lights will keep you updated on battery level and the power bank can withstand moderate impact and is available in black or blue. Boasting a 26,800 mAh battery that offers multiple recharges as well as security and simultaneous charging with dual ports this is a great choice. 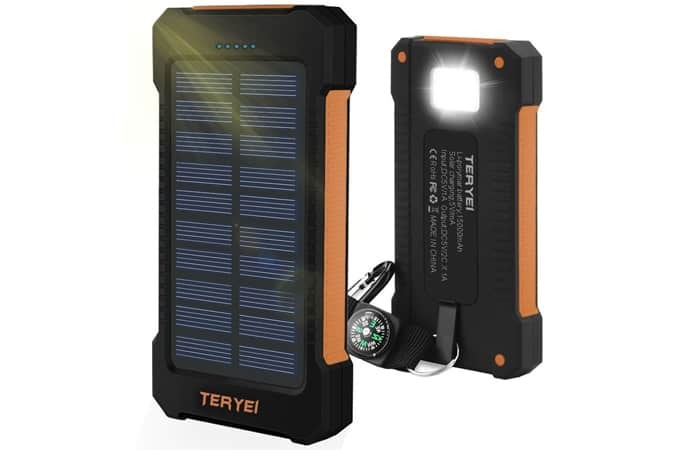 The 2 LED lights can act as flashlights and the other 5 LEDs display the battery level of the solar bank. A 12 month warranty and robust fabrication means it is all in all a very solid choice. The Ruipu device is the exact definition of what one would require if looking to charge an iOS device multiple times over along with an optimum efficiency. 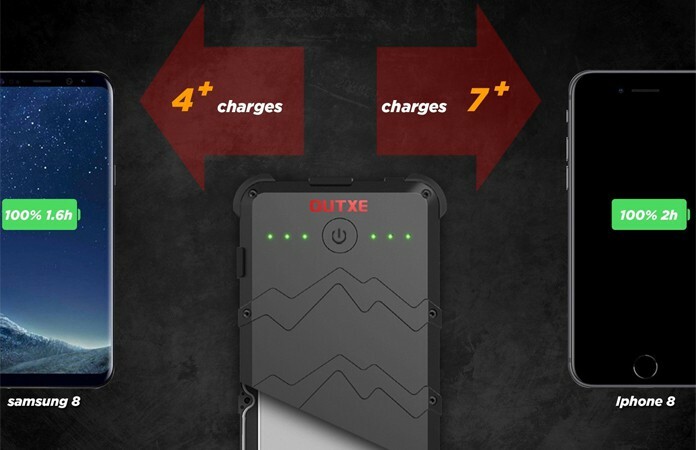 There is a massive 24,000 mAh battery which will allow you to charge your device very quickly. The 3 USB ports will allow the user to charge 3 devices simultaneously and it also provides a safe charge. The compact shape and design make it extremely portable and can be carried around or taken anywhere in a comfortable and easy manner. There is even an inbuilt flashlight for situations where light is an issue. As far as appearances are concerned, the Ruipu is also available in two colors, red or yellow and has a two year warranty. This power bank combines performance and reliability. 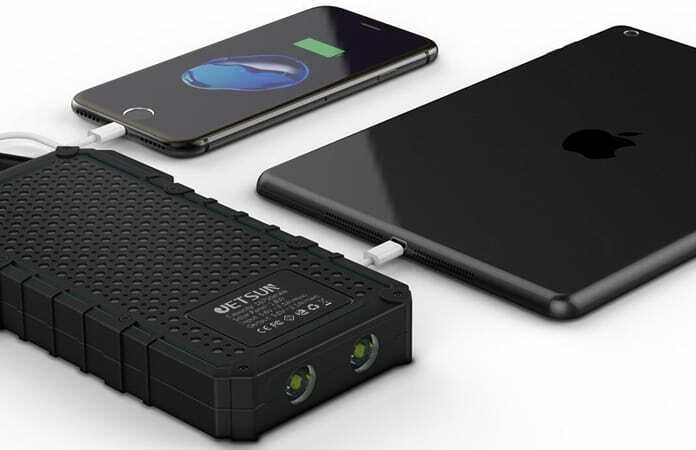 The 16,750 mAh battery along with the dual USB ports and build in LED flashlight offers all the standard options and features. In addition, the JETSUN is shockproof and comes in blue and orange along with a whole lifetime warranty. Raw power output is what this device offers in the form of a very high capacity 25,000 mAh battery, making it ideal for long trips. The dual port USB and 4 LED status LEDs along with the multi-protection system make it an attractive choice. In addition it is available in black, blue and orange with an 18 month warranty. 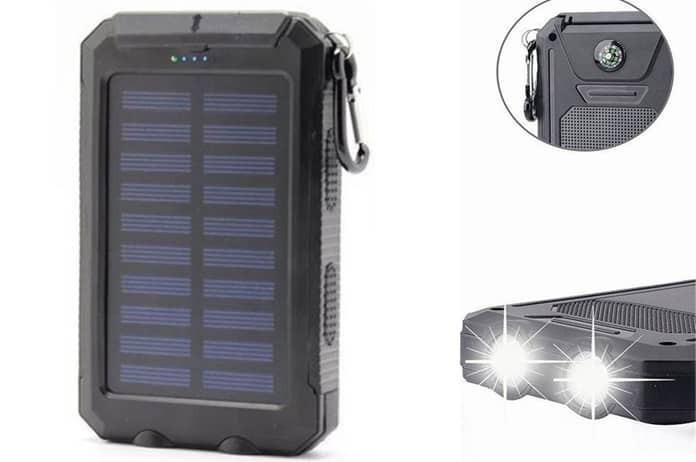 The military grade construction makes it very durable, with the IP66 water resistance, 20,000 mAh battery and LED flashlight along with three light modes (normal, SOS and strobe) this can charge devices up to 4 times faster. The 2W solar panel provides additional efficiency. 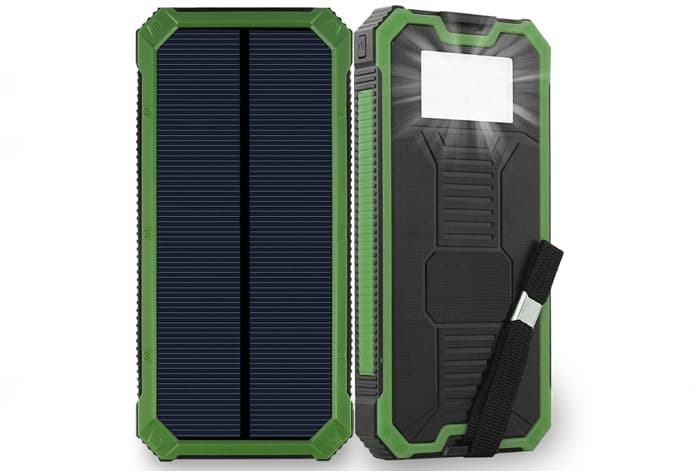 The TREIDEN solar power bank has a 12,000 mAh capacity along with two USB ports, allowing charging of two devices at the same time. 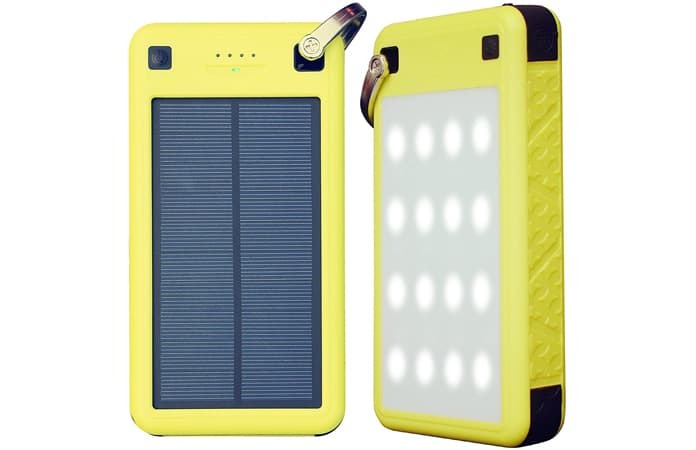 In addition, the high quality solar panel means that anytime you are in sunlight your device will be charged. This also features a built-in flashlight and an SOS mode for the dark or when in danger. It is made up of APS and PC material and is impact resistant to a certain extent. In addition, it is water resistant with an iPX6 rating and is available in blue or army green. This device has great power and efficiency with a massive 22,500 mAh battery charges devices very quickly. It has one built in LED torch with two modes like steady and SOS while the four LED indicators will let you quickly check power status. The robust construction means it is very durable as well. 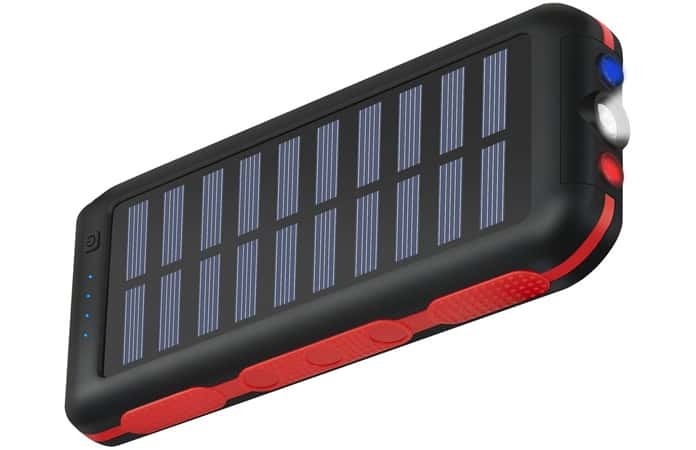 These are some of the best solar power banks we found online. Not only they allow you to reduce your electricity bills, but they’re stylish enough to enable you to make a compelling statement. Let us know which one you loved in comments below.